Everyone has problems driving an 8' ground rod into the ground with a sledge hammer. The rod wobbles every time you hit it. And it's easy to miss a wobbly target 7' off the ground even if you try to hold it still. A Rotary Hammer is like a Hammer Drill, except more heavy duty and it doesn't have the normal Jacobs chuck. 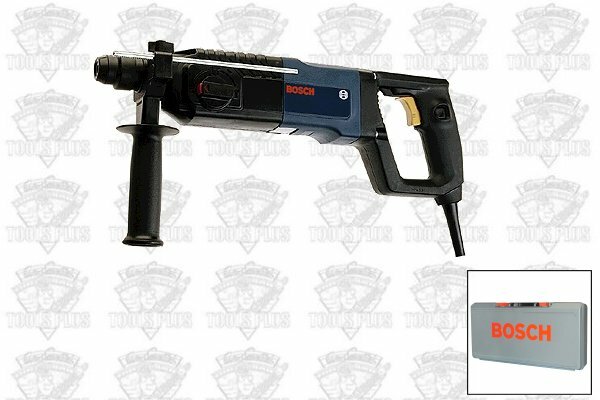 It has an SDS PLUS chuck which is designed for holding hammering type tools. Since it was the kit version (note the K on the end of the model number), it came with a package of hammer drill bits, plus a 10" long 3/4" wide chisel. The center portion of the chisel is a 6" long round shank which is 0.548" diameter. The 8' Lowe's copper clad ground rod is 0.565 diameter. So they're both pretty close to 9/16" diameter. I cut off the chisel end of the 10" chisel using a rotary air grinder with an abrasive disk, then squared up the end as good as possible, and then chamfered it. I got a piece of automotive heater hose about 6" long. It measures about 9/16" ID. I slid about 3" of the heater hose over the top of the ground rod and secured it tightly to the ground rod with a worm screw hose clamp. The remaining 3 inches of heater hose sticking up above the ground rod acts as a guide. Then I put my 8' step ladder next to the ground rod and inserted the former chisel's shank into the 3" of rubber hose sticking out above the top of the ground rod, and pulled the trigger. Within a couple of minutes the ground rod was 7.5 feet into the ground. I didn't even have to push on the Rotary Hammer. I just held it firmly on top of the ground rod.